DC Alert: Support the Iran Deal! Join CODEPINK for these fun events to support the Iran peace deal! Congressional Call Party at Busboys and Poets! Stop by Busboys & Poets. 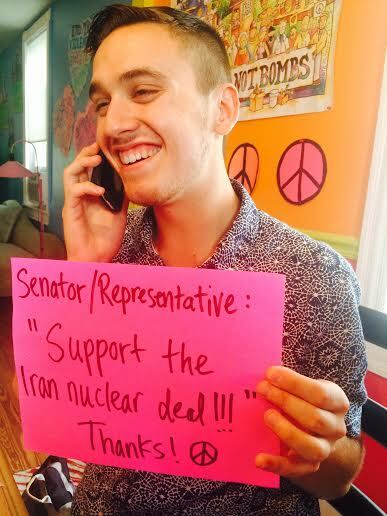 5th and K St any time during our all-day "call-in" urging Congress to support the Iran nuclear deal! We’ll be calling 100 key Senators and Congresspeople urging them to support the deal. Some offices are reporting that they are getting 10 calls against the deal for every 1 in favor. So let's get on the phone!!! We'll provide you with the list, the numbers, the script--even the phone if you need it. Stop by anytime during the day to make calls, enjoy some snacks (amazing Busboys food!) and great company! RSVP on the Facebook event now! Join us for a Picnic for Peace to bring together DC folks who care about peace and support the Iran nuclear deal. We’ve teamed up with the National American Iranian Council (NIAC), Busboys and Poets, and Jewish Voice for Peace DC Metro Chapter to host a dinner in traditional Iranian style, sitting on cushions on the the ground, eating around a tablecloth. Please email Mike@codepink.org to RSVP: if you want to bring 10 friends, you can sign up to host your own table. If you are coming alone or with a few friends, RSVP to join the CODEPINK table! Note: Please wear all white and bring your own cushion to sit on. Each table will coordinate its own food! We’re launching a peace insurrection outside Congress from September 8 until the final vote (which must happen by September 17). We’ll kick it off with a “Hands Around the Capitol” action on September 8 (time TBA), where we’ll join hands and surround the Capitol Building to show support for the Iran Peace Deal! Please come and invite your friends. Housing board request for people in DC area:We will be having folks joining from all over the country, and they need places to stay. Can you host one or more activist from out of town? If so, please email Mike@codepink.org and let him know how many people you can host for how many days, if you have pets (for allergy purposes), and if your house is handicap accessible. Save the date for the vigil! Thanks for taking a stand for peace!